Did you know you can now order your Deliveroo takeaway from The Imperial here on View? 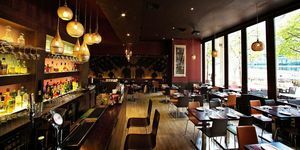 "Whether you are coming for a quick bite between meetings, a leisurely lunch with the girls, an important business meeting, a date night or a special occasion – there is something here for everyone. Sit in our elegant restaurant and have a gastronomic experience. Choosing from Tom’s carefully designed menu which focuses on local produce, healthy eating but most of all stunningly prepared dishes that will visually delight and give you a wonderful dining experience. Breakfast, Lunch and Dinner all served here. Don’t forget our Sunday Roasts too. Family style, to share. Pre-order a whole roast chicken or a leg of lamb. As well as the veggie roast for anyone not interested in eating meat." By sending this booking your details will only be sent to The Imperial and will never be shared with other third parties. By clicking this box you agree to the Terms and Conditions set out above. You can book to reserve an area of The Imperial for you and your friends. Just enter your requirements below to see what they have to offer. What did you think of The Imperial? 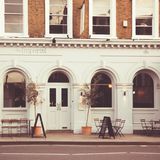 Just had an extremely tasty burger for lunch at The Imperial in Chelsea! I always find time to visit this bar and restaurant when in the area for the chilled out atmosphere, friendly and service and great food. 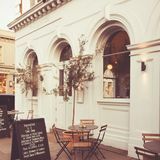 With impressive surroundings, excellent food and a well-stocked bar, The Imperial makes for a terrific night out. 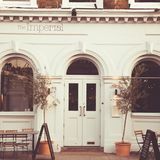 You’ll find The Imperial near the Fulham end of the King’s Road, not far from Fulham Broadway and Parsons Green tube stations. On the border between Chelsea and Fulham, this is one of the wealthiest parts of London, brimming with privately owned boutiques, appointment-only art galleries and luxurious interior design shops. The street is also lined with gorgeous Victorian and Georgian houses, worth well into the millions. Painted completely white with big arched windows illuminated by a series of uplighters, The Imperial stands out even in these high-end surroundings. Inside, the bar feels laid back and down-to-earth with large communal wooden tables, leading round onto the intimate dining room. The open-plan design, combined with high ceilings and minimal furnishings make The Imperial feel spacious and smart. It’s the kind of place that you can dress up or down for, while on a bright morning with light streaming through the windows, it’d be the perfect place to sip a latte and pore over the papers. In the dining room, the pass, (where the chefs plate the food), is in full view and becomes a feature of the room; the movement and voices of the chefs imbues the restaurant with energy, not to mention a warm and golden light. Tables are set a comfortable distance apart and there’s a small courtyard outside, fronted with glass doors. Service is professional, attentive and above all friendly: run by Kate MacWhirter and her partner Alan, their passion and knowledge after many years in the catering industry really comes across. Many of the dishes served at The Imperial wouldn’t look out of place in a Michelin-starred restaurant. What’s more, they taste as good as they look. 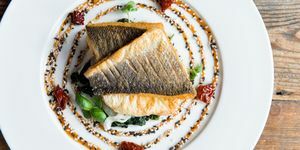 The menu turns around classic dishes cooked to perfection, such as risotto fish and chips or steak, as well as more adventurous plates inspired by far-flung places, including salmon sashimi salad (£14.50). It’s a menu you want to eat, devised around top-quality, seasonal ingredients, responsibly sourced fish and ethically-reared meat. Start with a bowl of plump and juicy mussels in a light cream sauce (£7.00), sharpened with a dash of sparkling English wine, or a fresh fig and goat’s cheese tart (£8.00) - a great way to tantalise the taste buds. Flanked by dots of honey and yogurt dressing, as well as chopped, toasted walnuts, this spectacular dish is stylishly presented on smooth black slate. For mains, there’s a perfectly balanced dish of pork belly, parsnip purée and emerald-green sprigs of curly kale, flecked with black pudding (£17.00). The glistening slice of belly splits into delectable layers of tender, slow-cooked pork, topped with a thin layer of crisp crackling. If a millefeuille could be made from meat, this would be it. Another option is venison loin, served with spiced red cabbage, herb polenta and a drizzle of rich gravy (£25.00). Sourced from Balmoral and hung for five days, the lean meat has a wonderfully rich and gamey taste, complemented by the strong aniseed flavour of the finely-grated cabbage and the soft buttery texture of the polenta. For desert, it would be a crime to leave without tasting the lavender and honey cheesecake (£7.50). This memorable dish is enough reason to visit The Imperial in itself, and cheesecake fans may well demand the recipe! A thin rectangle of sweet biscuit base is topped with a quenelle of tangy, smooth cream cheese, infused with a bitter and aromatic hint of lavender. Drizzled with concentric circles of honey and crushed honeycomb, this dish is an absolute triumph. Brioche bread and butter pudding (£7.50) consists of soft layers of sweet, eggy bread, soaked in a light orange and rosemary syrup. While it is a cosy and comforting dish, it lacks the magic of the cheesecake and could carry a stronger citrus or herby punch. The Imperial offers an exceptional drinks menu, ranging from affordable to blow out, such as Krug’s Grand Cuvée at £220 a bottle. Wines are categorized by their characteristics such as ‘big and bold’ or soft and quaffing’, which makes the menu easy to navigate and fun to read. 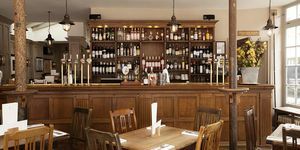 Draft beer, malt whiskies, and a decent selection of sherry are all on offer, and many wines are available by the carafe or glass. Mas de Lunes, from the Languedoc-Roussillon region in France (£6.50 per 175ml) is dry, smooth and fruity, while the Picpoul/ Sauvignon (£4.95 per 175ml) refreshing and clean on the tongue. 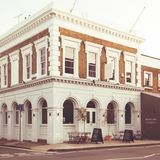 This fabulous gastro pub deserves its grandiose title. Expect food fit for a king in an unpretentious and stylish setting.